When Antone Edward Baltz returned to the Mid-South after World War II, he decided to go into the concrete business. More than 60 years later, his grandson, Kevin Baltz, carries on the family tradition as president and owner of Baltz and Sons Concrete Services Inc. He was just in time. In the 1950s, the concrete business exploded, thanks to an increase in federal building projects. Fast-forward to the 1980s, when Kevin Baltz began punching the clock at the family-run company as he worked his way through high school and got a business degree at Christian Brothers University. After graduation, Baltz relocated to Colorado, ready to start a new chapter in his career. Then in 1994, his dad, Tony Baltz, needed help. “He asked me to come back to Memphis to work on a particularly large project, and so I flew home for what I thought would be a temporary job,” Baltz said. It turned out Henry Turley had hired Baltz and Sons to take over the developmental concrete work — sidewalks, curbs and gutters — for Harbor Town and South Bluffs. “It was a gold mine,” said Baltz, “and we needed to either turn it down or turn our company into a complete operation. Baltz and Sons is “truly a family operation,” he said. Ironically, said Baltz, the project that brought him back to the concrete business was the most utilitarian work he has ever done. 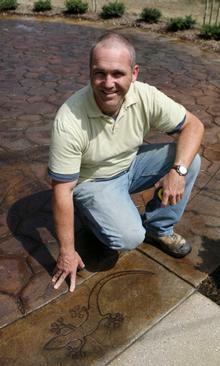 “My father’s reputation was built on decorative concrete,” he said. “A vast majority of our work is residential. We do over 200 pool decks a year. And we’ve won five awards from the Tennessee Concrete Association for our stamped concrete work, including Project of the Year in 2006 for the common areas of the Preserves in Arlington. Profession: president and owner of Baltz and Sons Concrete Services Inc. Personal: Wife, Shelley; daughters Emma, 7, and Sofia, 4.